DigitalNZ brings together more than 30 million items from institutions such as Te Ara - The Encyclopedia of New Zealand, Ministry for Culture and Heritage so that they are easy to find and use. We added this one from this URL on 29 April, 2013, and last updated what we know about it on 28 June, 2018. 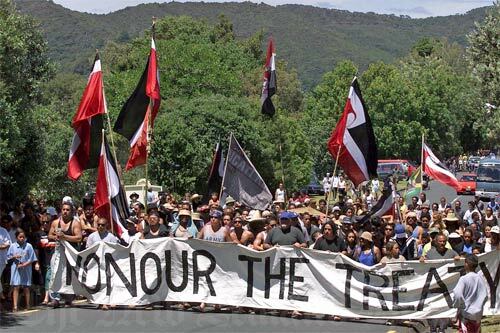 Waitangi Day is also an occasion for some to protest against breaches of the treaty. Sometimes disorder overtakes the celebrations, especially at Waitangi itself. This protest took place on Waitangi Day 2002.